Check it out and let it sink in. This Dumbo is smart. 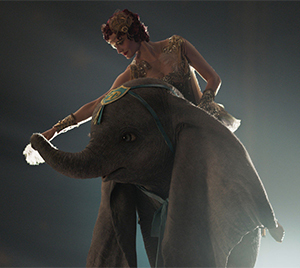 While Tim Burton's live-action version of Dumbo doesn't quite soar, it actually might be too smart for its own good. Give this one some time to be fully appreciated; it's one of those rare movies that gets better as it lingers in the memory. Dumbo starts off strong. Really strong. A montage of the traveling circus life, crossing the United States via the rails of 1919, is so colorful (including a smiley-face steam engine sweetly dubbed "41" as a slick reference to the original) and the cinematography by Ben Davis (Captain Marvel) is so evocative, the vibrant scents of spring fill the theatre. It's a sensation akin to Caleb Deschanel's masterful work in The Natural. That vibrant opening is quickly tempered by some harsh realities. There was the influenza pandemic of 1918 and World War I leveled a good portion of the planet. All of that set the stage for a grim economic outlook. It's a bittersweet reunion when Holt Farrier (Colin Farrell, Fantastic Beasts and Where to Find Them) returns to the Medici Bros. Circus after losing his left arm in the battlefields of the Meuse-Argonne offensive, the last battle of WW I — and one which took a devastating toll on American soldiers. His two children are fine, the ol' ringmaster is fine, but his wife was lost to the influenza outbreak. Somber times. But. C'mon. This is still a PG Disney venture. And it's still about dreaming big and one baby elephant with humongous ears. This time around, that baby elephant has more baggage to cover than just those ears. His mom, Jumbo, was bought from the proceeds of a horse sale. She was supposed to produce an adorable baby for audiences to embrace with love. But fate had something else in mind and — once Dumbo's magical abilities become clear — the circus life will never be the same. Before this Dumbo can be fully appreciated for all of the subtext, context and necessary narrative rejiggering, it might take some time for audiences to first get past the popular triumphs of Disney's live-action takes on The Jungle Book and Cinderella; plus, Jon Favreau's live-action Lion King is right around the corner — with a July release — and it's already taking a lion's share of the attention. Ultimately, even the original Dumbo is a dark horse in the race for hearts and minds among the original animated features. Here, the screenplay by Ehren Kruger (who can be blamed or thanked for his contributions to three of the Transformers movies) is a thorough reimagining of the 1941 animated feature. That original, with a spritely 64-minute run time, kept the human element to a minimum and focused on the traditional Disney world of anthropomorphic animals, including talking mice and crows. Now, Dumbo has a full roster of human characters to help advance the emotional core, while still maintaining references to those beloved elements of the original. This time around, the uniformed mice get health checks to ensure they're ready to perform. And, of course, those famous lyrics about seeing a house fly and a dragon fly get an encore, as do the dancing pink elephant-shaped soap bubbles. Dumbo marks the fourth feature film Burton's directed for Disney (including Ed Wood for the Touchstone shingle) and it's also a reunion of sorts for the Batman Returns crew, including Michael Keaton (the visionary and malicious V.A. Vandevere), Danny DeVito (ringmaster Max Medici) and Danny Elfman (musical score). Plus, Eva Green returns for a third round with Burton, this time as Colette Marchant, a beautiful French trapeze artist. Keaton's Vandevere (dubbed the "Emperor of Enchantment" and the "Columbus of Coney Island") is a quirky version of Uncle Walt Disney (the vision of an amusement park that makes the traveling circus obsolete — have the audiences come to you) and Florenz Ziegfeld Jr. (showmanship and stagecraft) tainted by elements of P.T. Barnum ("there's a sucker born every minute) and James Cameron (the megalomaniacal). His amusement park teasingly foreshadows elements of Disneyland, with theme parks predating Tomorrowland and the Jungle Cruise. It's a fantastical world that's perfectly suited for Burton's visual and storytelling sensibilities. And it's a marvelously multi-textured canvas for Burton and his troupe to stage a spectacle. Consider this as a glimpse at that fragile and exciting time when life was still simple but was teetering right on the cusp of becoming complicated. Vandevere's park showcases what life might be like in the future — artificial limbs make people complete while robotic contraptions and other technologies invade the house with an aim of making life easier. And Holt's daughter, Milly (Nico Parker making her big-screen debut), dreams of moving out of the shaky circus life and making a name for herself in science, following in the footsteps of Marie Curie, winner of the 1911 Nobel Prize in Chemistry. All of these elements gel together to make Dumbo something special. Sure, not every moment hits the mark. There is a key scene in which Dumbo takes flight that should recreate the shivers of elation generated by E.T. as he made those bikes take flight. The magic is there, but the impact isn't quite the same, even as Vandevere looks to the sky and giddily states, "You've made me a child again." The bigger picture, though, is terrific. The theme of the original Dumbo is right there. Everything you need is right inside you — Dumbo doesn't need a feather to fly, he just needs to believe in himself. And Milly doesn't need that key necklace to unlock her future, she just needs to have faith in herself. It's become a familiar refrain, hit on often by Disney productions these days — it's in great movies like Mary Poppins Returns, mediocre entries like Captain Marvel and stinkers like The Nutcracker and the Four Realms. But Dumbo takes the theme back as its own. Burton enhances it as he revisits another component of those bygone days: the circus freaks. Humorously, the World's Strongest Man is also the World's Most Versatile Man as he has to keep the circus books and perform as a literal one-man band. And then the freaks get their time in the sun as they put their freakish talents to use in service of saving Dumbo and Jumbo.